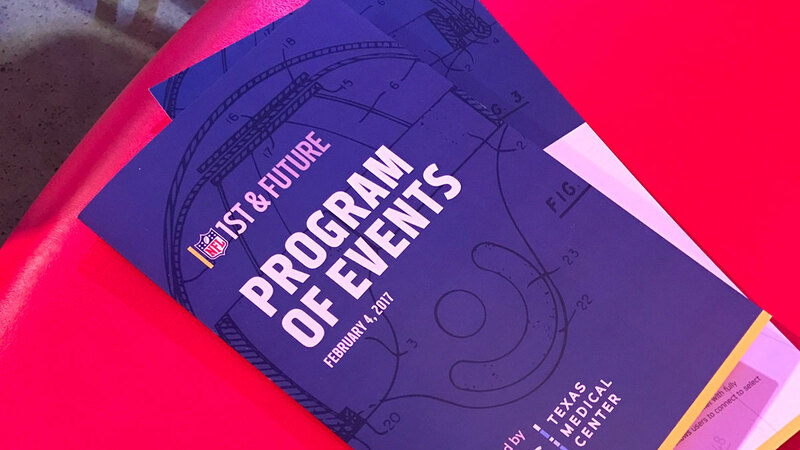 Design and execute the second annual 1st and Future event, held in 2017 at the Texas Medical Center (TMC). 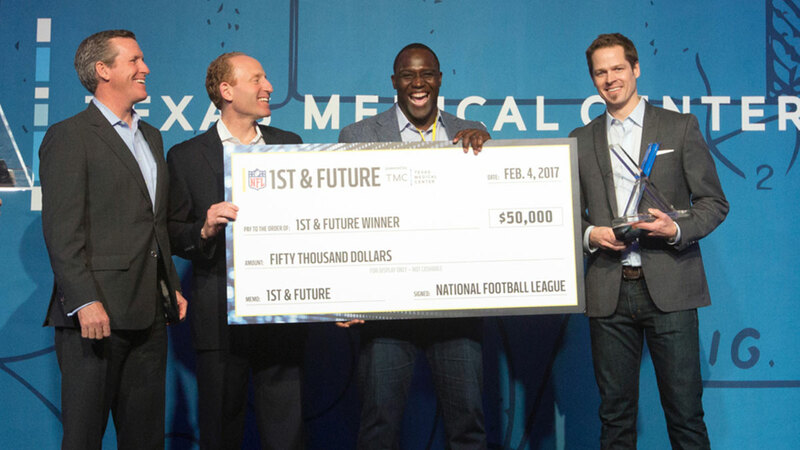 The event was produced in a partnership between the TMC and the NFL, and allowed both studio and on-line audiences to witness and enjoy this Shark-Tank style competition that welcomed 36 contestants to pitch their sports-centric startups. 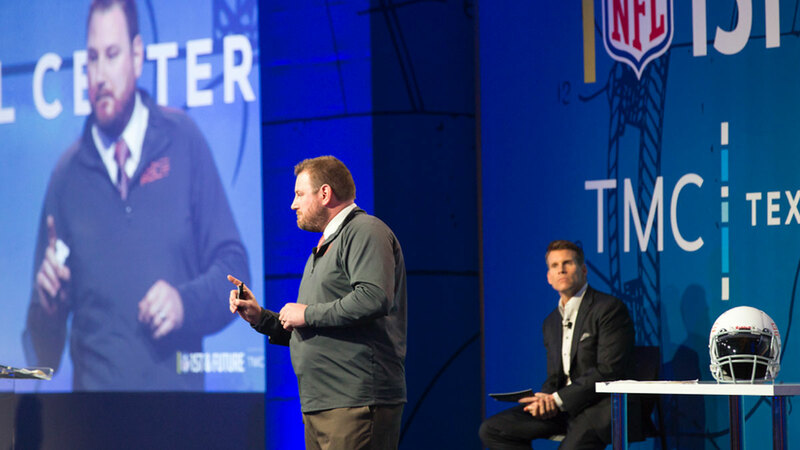 Showcase the TMC brand on par with the beloved NFL brand, synthesize the conflicting demands of live and televised event production, and do it all in a limited physical space on a short timeline – over the remaining few weeks of the holiday season. The production value for this broadcast had to be high to ensure TMC’s identity was well presented, not to mention partnered with one of the most watched brands in America, the NFL. 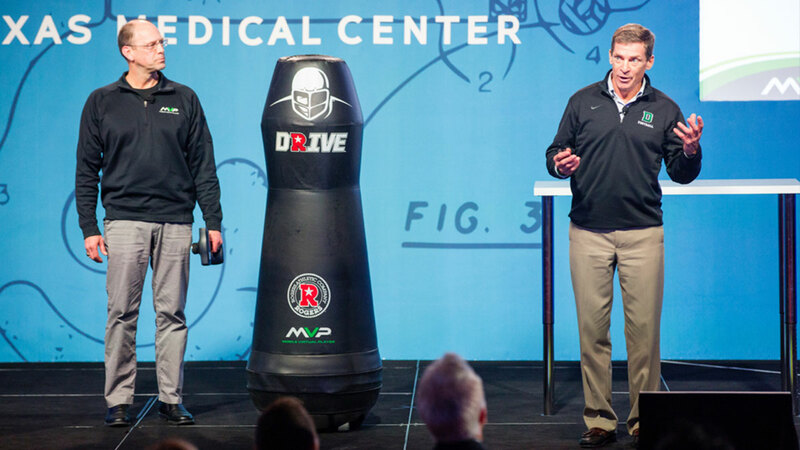 Staging Solutions’ first down was to design and build a slick, accommodating space that highlighted both brands, and elevated the proceedings to the look and feel of an ESPN-type sports broadcast. 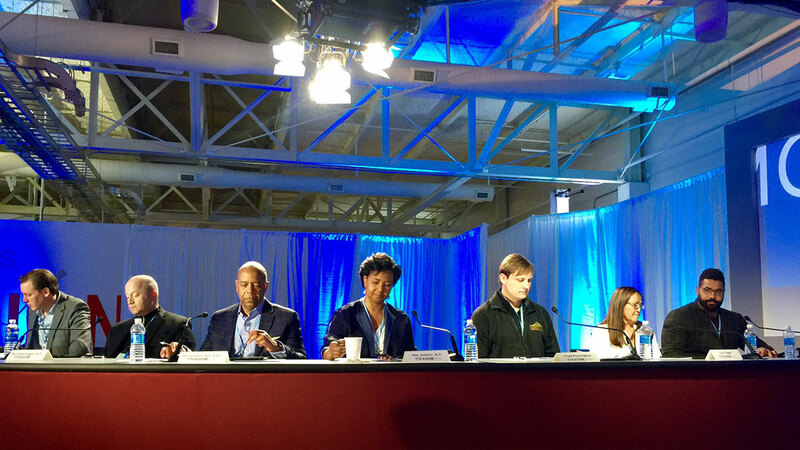 A custom-built curved anchor desk accommodated the competition’s nine judges, who engaged with presenters using award-style mics; the presentation stage hosted product demonstrations by 36 contestants; a lectern for the host, NFL Network Reporter Scott Hanson; accommodation for group presentations as well as discussion for guests TMC’s then-President Robert C. Robbins, GE CEO and Chairman Jeff Immelt, and NFL Commissioner Roger Goodell; and accessibility for presenter Greg Abbott, Governor of Texas. Furniture selection, lighting design, and media support provided an environment worthy of the NFL and TMC brands. Resolving the different needs of a live audience in the room vs. a broadcast audience was our next charge down the field. The footage was encoded on site for successful streaming, and shot with a jib that fit under the room’s low ceilings and captured engaging angles for the online viewers without interfering with the live audience’s enjoyment of the show. Consistent presentation of both brands was achieved through careful execution of camera angles during the proceedings. The event was live-streamed to the websites of both TMC and NFL, and engaged thousands of viewers across the US and in over 13 foreign countries. Achieving success on the timeline required a quick snap: Throughout the last week of December 2016, and the early weeks of 2017, Staging Solutions ran the ball through the approval processes of both the TMC and the NFL for custom designs and layouts to reach the end zone on time and within budget, and adhering to the highest brand standards. We overcame the deficits of the space – difficult to access and not constructed for broadcast – to produce something unique to our client, reflective of their organization’s personality, and of the highest quality. 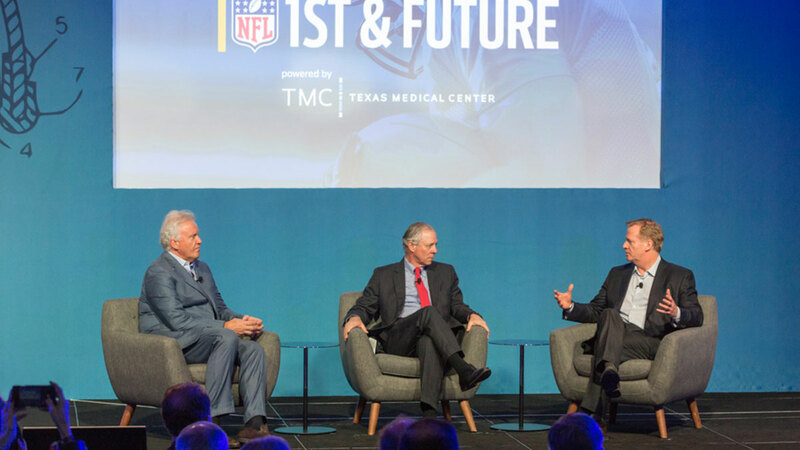 – Molly McCabe, Marketing & Communications Manager, Texas Medical Center.
.@NFLCommish and industry leaders hear from start-ups on their game-changing technologies.